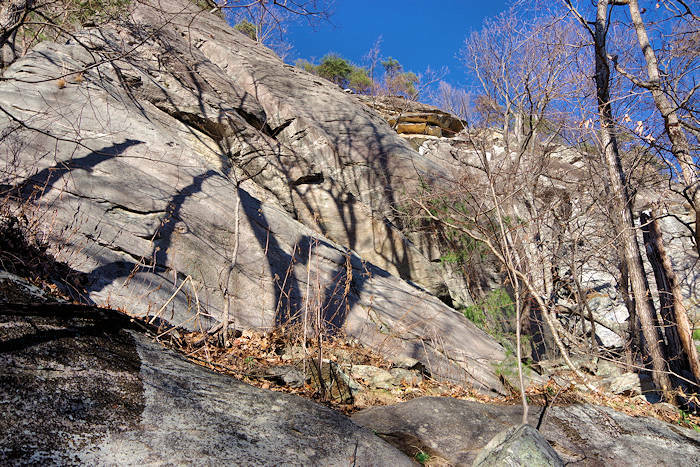 This 1.5-mile loop trail in Chimney Rock State Park takes you to the boulder fields and base of the cliffs of Rumbling Bald Mountain that towers over Lake Lure. The large parking area is about two miles from the main Chimney Rock Park entrance (so there's no admission fee here). It's also a favorite rock climbing location. 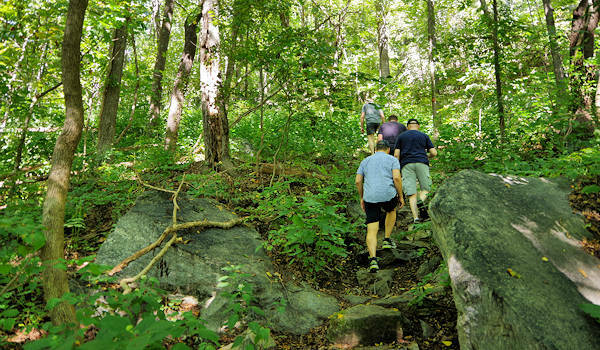 The woodland hike has some uphill sections, but it's easy enough for most fitness levels. 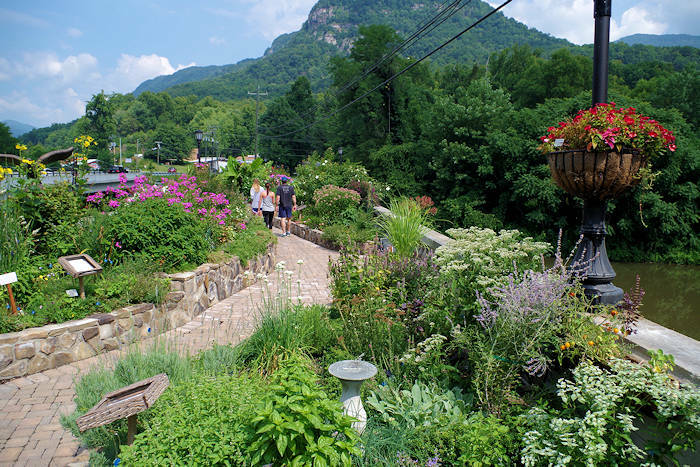 It's a great way to explore the Hickory Nut Gorge. Views of the cliffs are best when leaves are off the trees. But in the summer, the leaves provide a shady trail to escape the heat. After you walk a short distance, you'll come to an east / west fork that begins the loop. We like to take the right (east) fork of the trail and go counter-clockwise. After about a half mile walk, you'll arrive at the first of the bouldering areas. 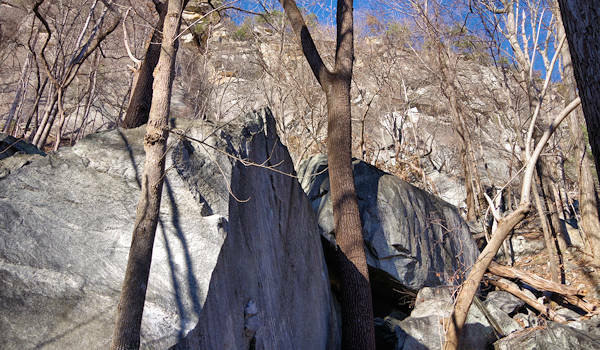 You'll see a side trail to the east boulders. Follow the sign to Cereal Buttress to stay on the loop. 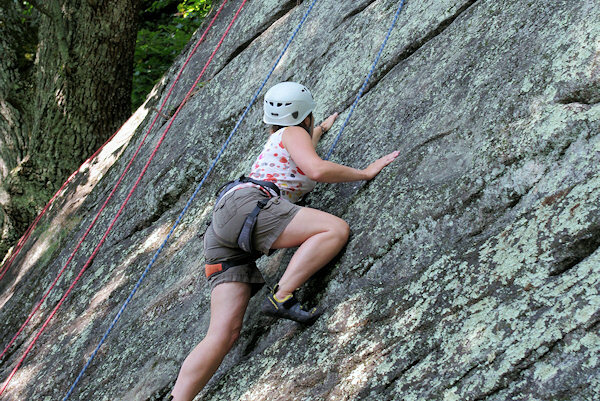 The Cereal Buttress is the most popular spot for climbers at Rumbling Bald. It has a big variety of routes. The name is credited to climber Jeep Gaskin - in the mid 1970s he mentioned that he found a "surreal buttress" and someone jokingly ask what kind of "cereal". Now, climb routes have names like Fruit Loops, Granola and Frosted Flake. Peak climbing time is November though March, since the sun bakes the south facing cliff in the warmer months. 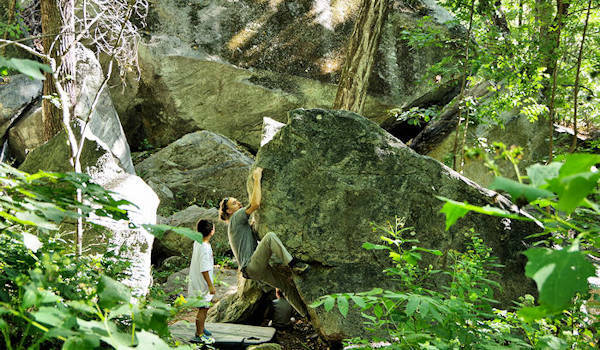 The "Breakfast Area" has many boulders that are fun to explore and climb without special equipment. Or you can watch climbers scale the rock face when leaves are off the trees. Continue the trail as it climbs past this area - toward the Central and Cliff Line Boulders as you walk parallel to the massive rock face of Rumbling Bald. In about a third of a mile, the loop curves to the left to take you down the ridge back to the parking area. A great winter hike option! This area was in the middle of the Party Rock wildfire that burned 7,000+ acres in November 2016. 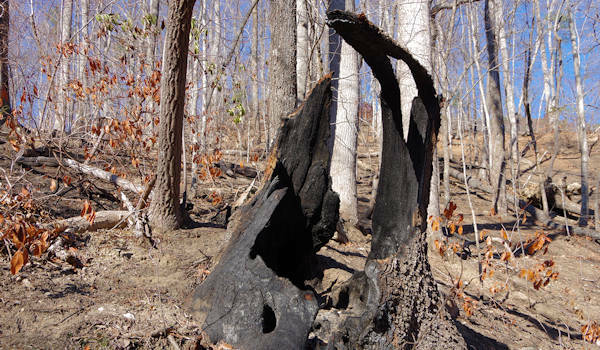 Fortunately, the fire burned mostly at ground level with an abundance of dry leaves. So while much of the underbrush and smaller trees and shrubs burned, most of the larger trees survived.. Read more about the wildfires. 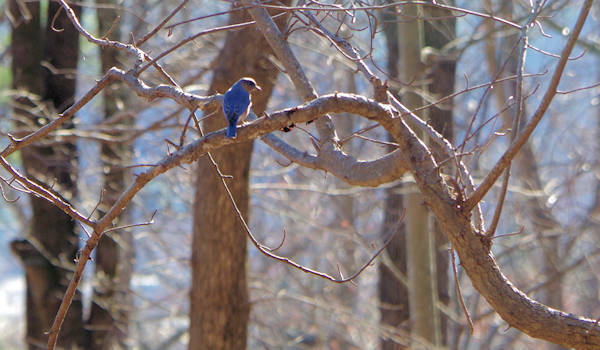 This is a great bird watching area too! There is no admission fee for this hike. 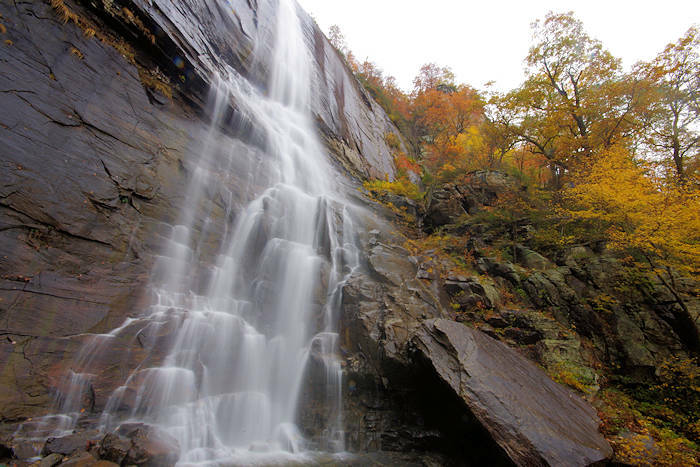 It's about 2 miles from the entrance of Chimney Rock at Chimney Rock State Park in the village.